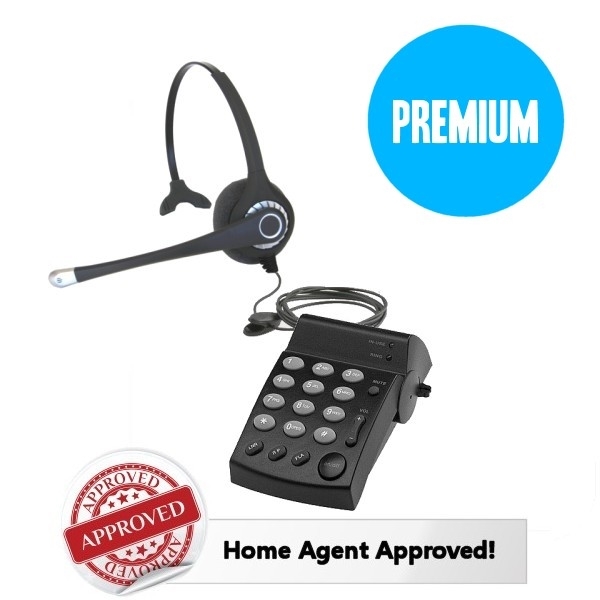 Are you looking for a top of the line, sleek and professional headset? One of our FLEX SERIES HEADSETS would be your best choice! Good looking and great sounding, the Flex Series is the rock star of headset telephones! Available in single ear or dual ear wearing styles, the Flex Series headsets are designed for years and years of heavy use, comfortable wearing and superior noise canceling. 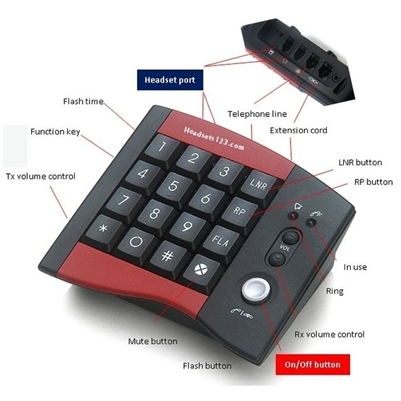 They feature a quick disconnect cord allowing you to easily unplug the headset from the dial pad or to add the optional USB cord if you need to plug into your computer. The Flex Series is our only line of headsets that offers wide band technology enabling crystal clear communications for telephone calls via VoIP. Additionally, the Flex Series is our only line of headsets that allows the use of our oversized ear cushions (optional) – 3.75″ x 3″ leatherette extra large ear cushions (sold as a pair) and come with cotton covers too. Great for use in cold areas! The microphone boom adjusts 270°, allowing total flexibility and comfort as well as superior communications. Choose the Flex Series Headsets if you want Exceptional Sound and Style! 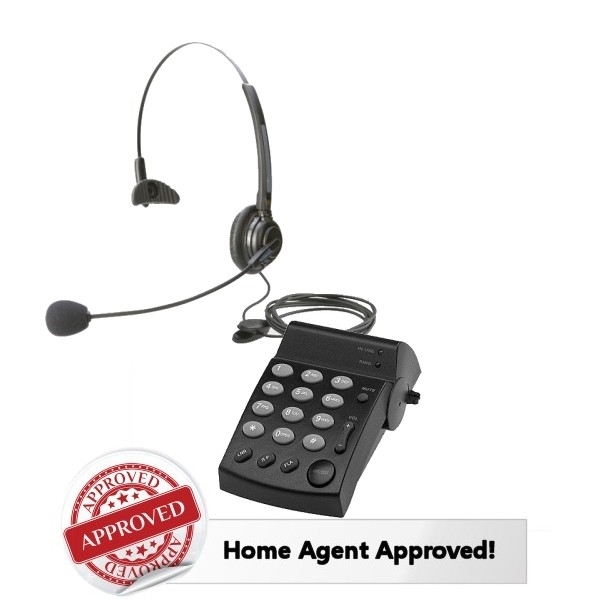 Coupled up with the DA207 Computer Style Dial Pad, the Flex Series headset makes a top of the line home agent approved headset telephone. If you are looking for a budget friendly, entry level headset telephone system look no further than the Eco Series system! 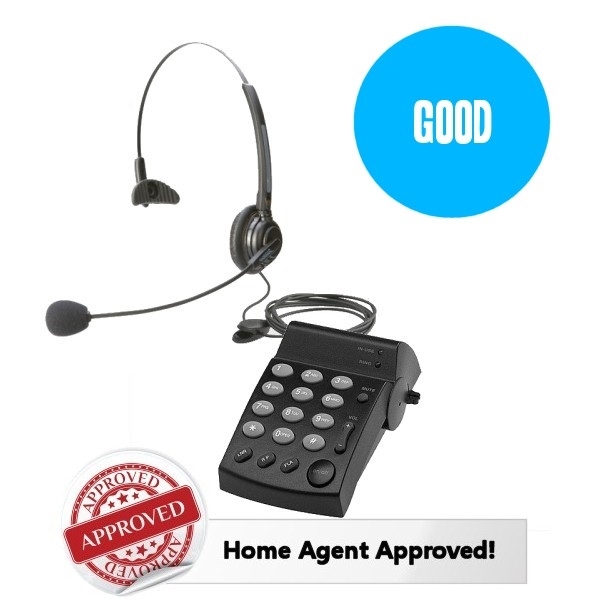 The Eco Series headsets are perfect if you need a basic home office headset telephone system, plan on medium/light call volume use or are just testing the waters as a work at home customer service agent. The Eco Series headsets are available in either single ear (monaural) or dual ear (binaural) designs. They are lightweight with adjustable headbands. 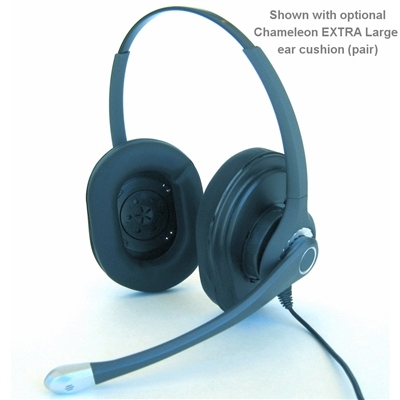 They are noise canceling headsets and come with comfortable leatherette ear pads. These headsets differ from our other headsets in that they do not have the quick disconnect feature. 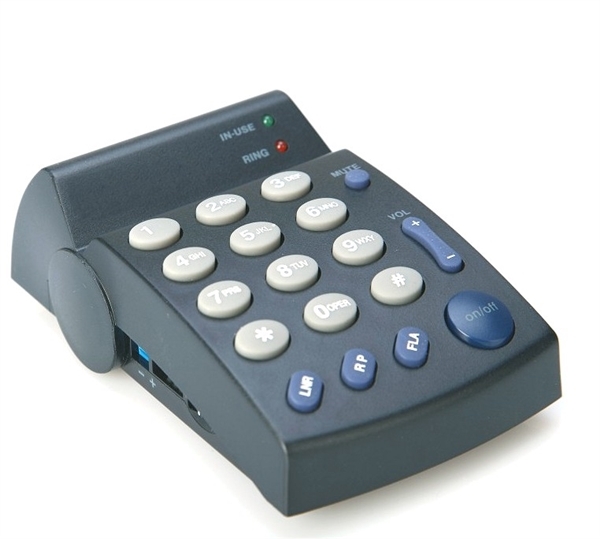 Instead, the headset cord ends in the standard rj/modular plug that connects directly into the telephone dial pad. 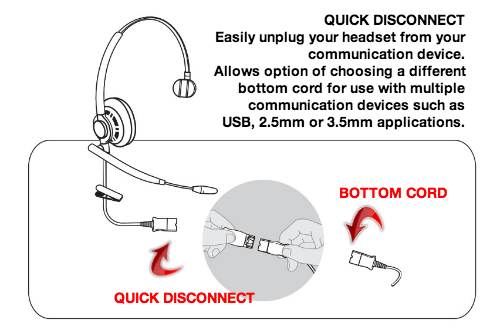 This is important because our other headset series with the quick disconnect feature allow you to switch out the cord to a USB connection for training purposes. If you don’t need the USB connection, you can save some $$ and go with this ECO Series System. 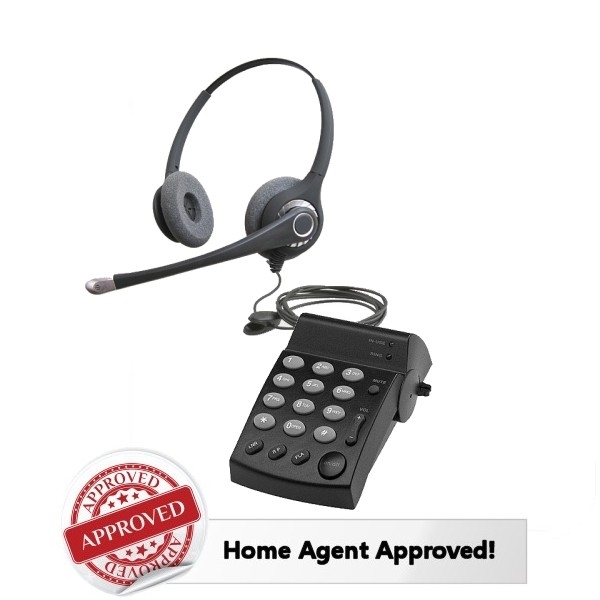 Coupled up with the DA202 Dial Pad, the Eco Series headset makes a budget friendly home agent approved headset telephone. How do you balance the mustn’ts, the don’ts, the shouldn’ts and the impossibles with the must’s, the do’s, the should’s and the possibles? Oh how I LOVE the Air Series headsets! Here’s why: I have a surprisingly large head 🙂 Seriously, I find hats uncomfortable, can’t tolerate headbands… So wearing a headset all day has been a challenge for me. That was until I tried the super lightweight Air Series! It is, hands down, the most comfortable telephone headset I have ever tried on. At least for my sensitive head, I find it to be a perfect fit. It weighs just 2.3oz and the headband itself expands a little bit more compared to most other headsets. It comes with both foam and leatherette ear cushions so you can decide what’s most comfortable for you. The foam ear cushions rest comfortably on my ears and I find I don’t get a headache even if I wear the headset throughout the day. I personally prefer the single ear model, but I don’t work in a very noisy environment so outside distractions are not an issue for me. It’s also available in a binaural design (covering both ears) if outside noise and distractions are present in your working environment. The Air Series is one of our call center grade headsets designed to withstand heavy call volume and lots of use. 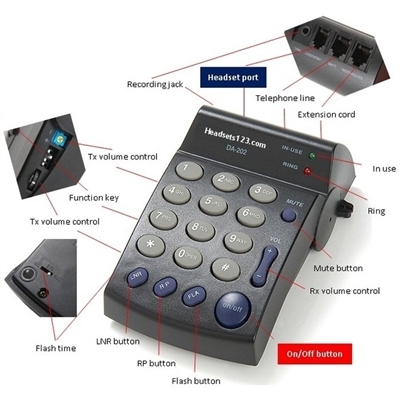 It features the quick disconnect cord allowing you to easily unplug the headset from the dial pad or to add the optional USB cord if you need to plug into your computer. It has a matte black rubberized finish and, like I said, is incredibly lightweight and comfortable. Can you tell it’s my favorite? 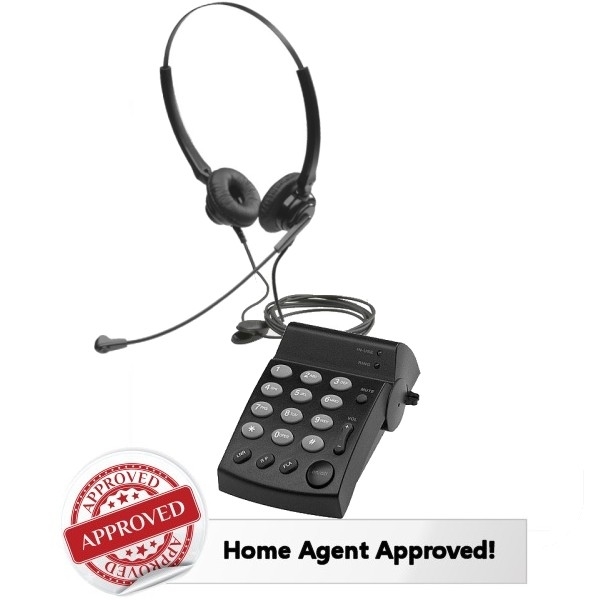 Coupled up with the DA202 Dial Pad, the Air Series headset makes a perfect home agent approved headset telephone.